This archival conference recording set includes presentations by herbalists Michael Moore, Deborah Frances and Cascade Anderson Geller. Topics include antiviral and antibacterial desert herbs, botanicals for hepatitis C, joint pain and inflammation, mitigating the destructive effect of chemotherapy, interventions for hyperreactive immune systems, and much more. Other speakers: Paul Bergner, Yong Deng, OMD, Ryan Drum, Kenneth Proefrock, Kevin Spelman, Jill Stansbury, David Winston and Eric Yarnell. The printed book of lecture notes is available by special order. Contact us here. 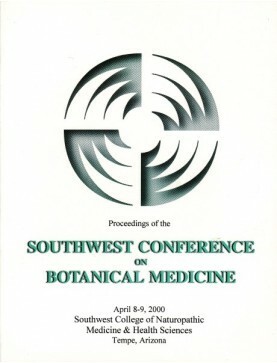 2000 Southwest Conference on Botanical Medicine: Conference Book. Order download of PDF f..
Speaker: Ryan Drum. Theories which explain the explosion of thyroid dysfunction in today's soci..
Speaker: Deborah Frances. This lecture focuses on herbs used to treat chronic arthritic sy..
Speaker: Michael Moore. North American antioxidant herbs are described, including yarrow, astra..
Speaker: Yong Deng. The classical Chinese therapeutic approach to this condition. Pattern..
Speaker: Dana Myatt. Systemic considerations in skin health include therapies for GI, liver and..
Speaker: Ryan Drum. Herbal therapies and a healthy lifestyle can restore health. Includes..
Speaker: Michael Moore. Includes a description of the actions of Ailanthus altissima, Amorpha f..
Speaker: Deborah Frances. Discussion of precipitating factors, the "leaky gut connection," ..